Christmas is almost here and we are all in the festive mood. The winter has not been any forgiving this year either, for those of us who gets those dry patches and flaky skin during cold climate. Inspite of all that, I really like Christmas time. I have already set up and decorated my Christmas tree and I am very much looking forward to enjoy the holidays. 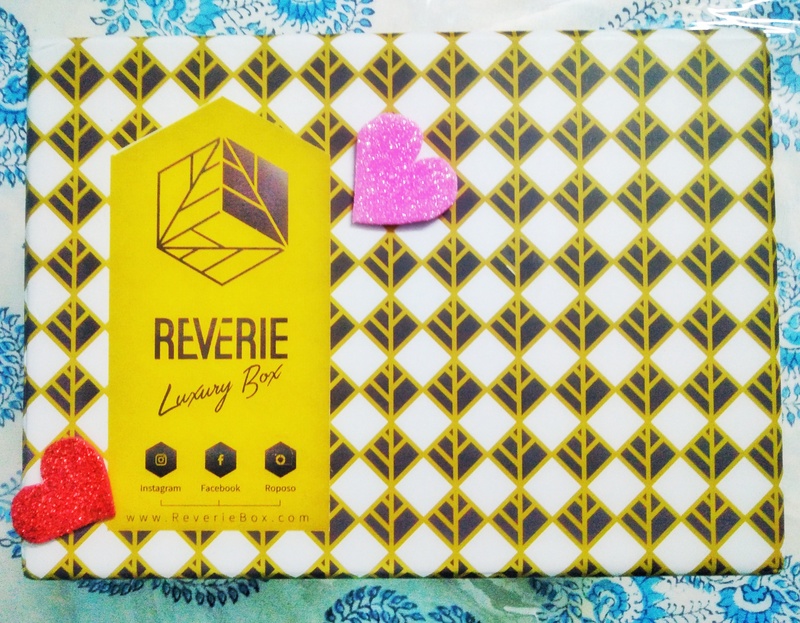 Reverie box is a natural skin care subscription box in India, that just started on October. They provide full size products that are not animal tested and free of parabens, phthalates, formaldehyde, sulfates and other nasties. They specially curate products for each customer based on their skin issues and requirements. 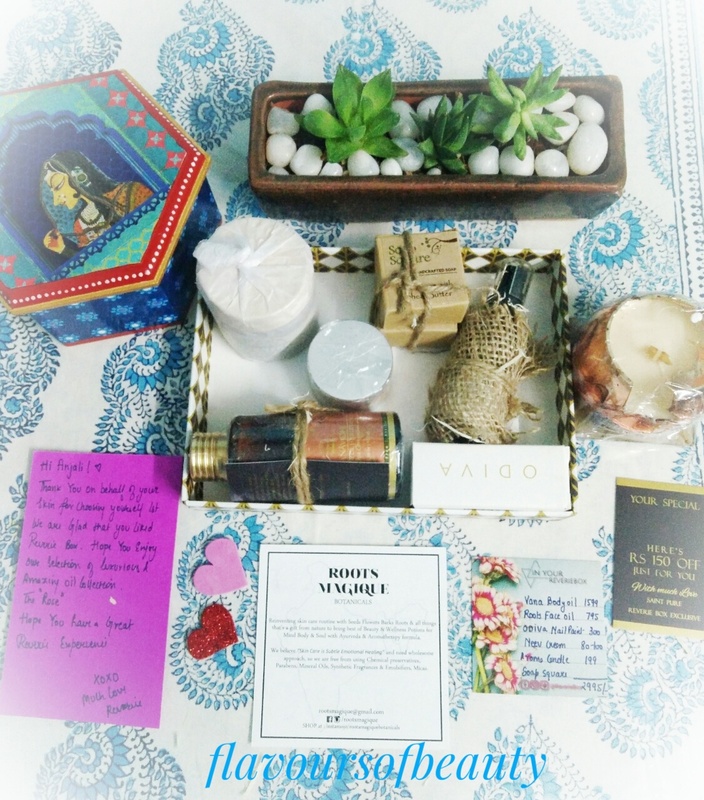 They have tie up and include products from green skin care brands like Ayca , Junaili , Vana Vidhi , Bon Organics , Saint Pure , Soap Square , Burst of Happyness , Neev , Ma Earth Botanicals and Roots Magique. 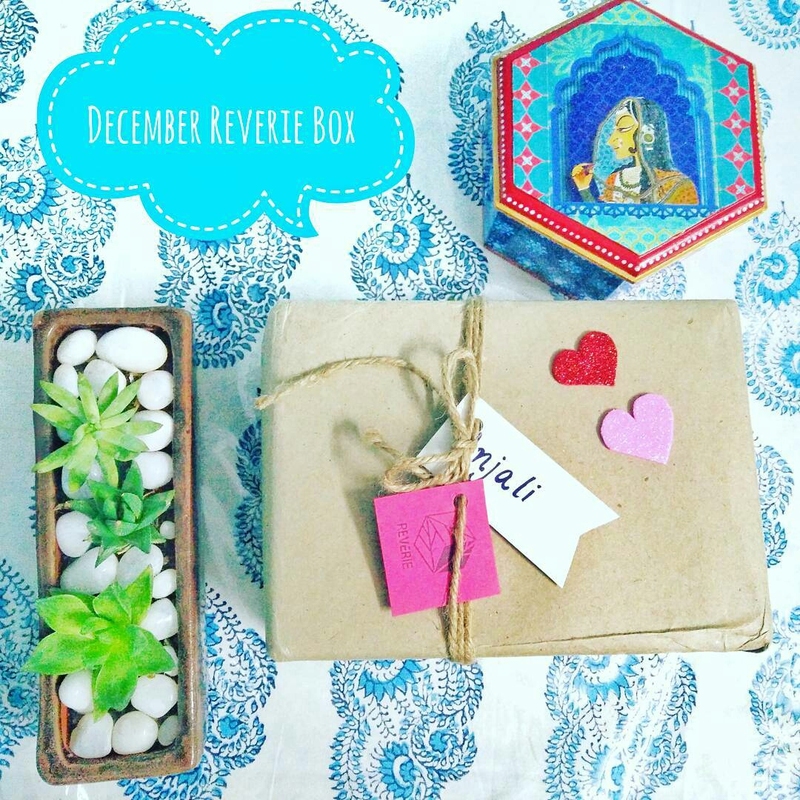 I have been following the brand for last 2 months and when I got to know that December box is a winter skin care box, I couldn’t stop myself from getting one of these. So the people from the brand contacted me and asked for my skin concerns. Once we discussed about skin and body care products, I was sent the box at the beginning of December. Price: 1499Rs on prebooking. The total cost of all the products int he box will easily come to 3000Rs. Packing: The outer package is secured with yarn strings and has your name tag. The inner one, is a good quality, sturdy box that can be used to store products. Their was a complimentary candle in a glass case in the box that broke in transit 🙁 The reverie team contacted me regarding this and warned me to be careful while unpacking. There are 4-5 full sized products in each box and few complimentary products in sample size. I got a card with all product names and prices, another one with product details of Roots Magique and a discount voucher from Vanavidhi. Vana Body oil, Roots face oil, Odiva gel nail paint, Neev cream, Aroma candle and soaps from Soap square and Junaili scrub. I had asked for a non-drying body scrub and I was looking forward to trying out products from Junaili. I am so happy that I got it in the box. The first thing that strikes you when you open the box, is the amazing rose aroma from the soap square soap pieces. I am not a big fan of face oils, but Anchal, my skin care advisor from the reverie team assured me that the one from Roots Magique will help in combating blemishes and dryness. Another interesting product I got, is the Vanavidhi breast massage oil. It claims to increase the size of breasts on regular massage. Well, I am not so keen to try that but I feel this works well as a moisturizer for winters. It has a faint sweet natural, floral aroma and is very light and non-sticky. I have started using it as a body oil and I use it especially on those dry patches on knees and elbows.Vanavidhi is a luxury beauty brand and eventhough I wanted to check out their products, the cost just kept my interest at bay 😛 Happy that I got once of them in the box. I have started using Roots Magique face oil at night. I really love the bottle with the nozzle and plastic cap. But I am a bit concerned if this is causing me to break out. There were minor glitches in the December box apart from the broken glass case of the candle. The team informed me that the Neev cream might be contaminated because of moisture and when I checked I found it to have black molds on top. The team assured me that it will be replaced and they were really apologetic and helpful. Also the Odiva nail color was supposed to come in the color of our choice. But the one I got had a different colour. But it was okay as this is a really pretty colour as well. I am really impressed by the customer service of the brand. The person who contacts you via whatsapp, is available 24*7 to answer your queries. The products are from cruelty free brands and are free from chemicals and are not just samples but full sized products. I am really happy with the dedication and love the team puts to curate each box. 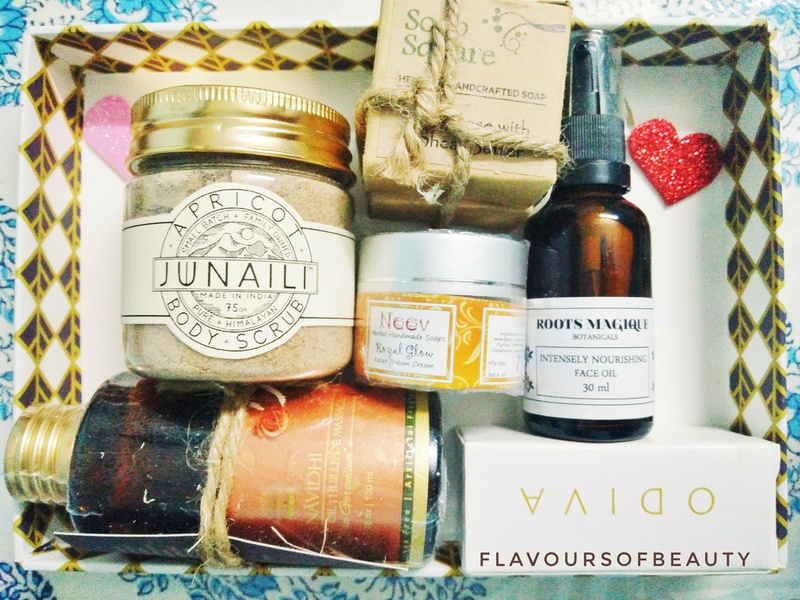 If you are looking for a bunch of skin and body care products curated just for you, that are all natural, I would definitely recommend this one over any other subscription boxes in India. I wish the reverie team all the very best. Also follow me on Instagram here to see the christmasy nail art I created,using Odiva gel nail paints with mirror shine.